The most well-known religious building in Budapest, St Stephen’s Basilica, took almost 60 years to build. The cathedral, which was consecrated in 1905, was built based on the plans of József Hild. The second tallest building of Budapest is not only popular because of its stunning exterior and interior appearance. In the shade of the Basilica, anyone can find a place to relax, and this experience is enhanced by several nearby restaurants and catering establishments. The enormous, Greek-cross shaped building’s western facade, set between two towers, is a magnificent sight. Under the group of statues in the tympanum, a popular passage from the bible expresses the building’s monumental legitimacy: EGO SUM VIA, VERITAS ET VITA, that is, I AM THE WAY AND THE TRUTH AND THE LIFE. The stairs and the square around the Basilica is always full of people. In the summer, tourists and locals pass their time here, while in the winter, the square plays host to a magical Christmas market. 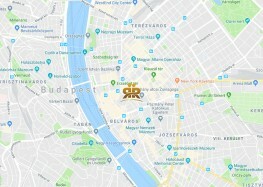 You can reach the impressive, yet cosy and inviting area surrounding the Basilica from Károly Corner Residences with a pleasant 10-15 minute walk.